The MPX16 is a great starter sampler and does basic sampling and sample playback well. Cheap and portable with good build quality. It's easy to use and works as a basic pad controller over MIDI. Great to have at gigs for simple loop and sample triggering. Presets are pretty poor. No battery power. No chorus or delay effects. Following on from Akai's entry-level sample player (the MPX8), Akai now has a bigger brother to add to the range and the MPX16 improves on the MPX8 in several ways. Firstly, instead of eight MPC style pads, there are now 16, allowing you to have twice as many samples under your fingertips. The pads are pretty sensitive (which will please the finger drummers out there!) and polyphony has also been increased to 64-notes, which obviously helps when you're triggering several samples simultaneously. It's also worth noting that this isn't an MPC, so it doesn't have any sequencing facilities. 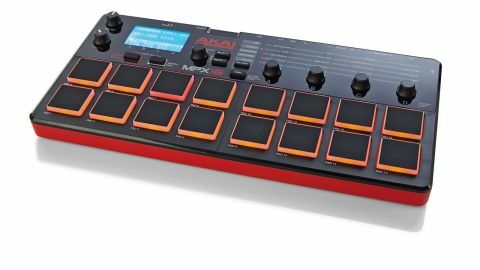 The overall design is typically Akai and in the flesh it looks good with its textured red/black chassis and glossy control panel. The white on blue display conveys info such as the selected kit, panning (and more) and build quality is fine - although there's a little wobble in the pots, the dials don't feel like they're going to be breaking anytime soon. "The MPX16 is no doubt a very handy device not just for dropping samples live but also for capturing ideas on the fly"
Talking of dials, there are seven onboard - one for master volume, one for record gain, one for scrolling (that also doubles as an enter button when pressed) and then there are four further dials over on the right labelled A,B,C and D which are used to edit the 19 real-time parameters available via the front panel matrix. In practice, the matrix editing works well - simply press Pad Edit to select the line that includes the parameter you want to edit and tweak the corresponding real-time dial. Real-time tweakable parameters include amp attack and decay for shaping the volume envelope, filter attack and decay for shaping the tonal envelope and there's a basic low-pass filter with cutoff, resonance and envelope amount - the filter sounds okay too. You can also tweak volume, panning and reverb level (on a per pad/ sample basis) and the onboard reverb sounds fine, whilst sample tuning and start/end points can also be adjusted. In Sample Edit mode you can tweak start and end points (though there's no waveform display - it's all done by numbers MPC3000 style!) plus you can reverse, normalise, add fades, convert stereo to mono, extract parts of a sample to a new sample and copy/ rename. All user samples have to be on an SD or SDHC card (which unfortunately isn't included) and you can also sample via the built-in mic or via the line inputs directly to the card and load up to a maximum of 60MB of samples across the 16 pads at any one time. Strangely, the preset memory included on our review unit only included ten kits (and the quality of these sounds was nothing to write home about either) but the whole point of this box is to throw your own samples in, so we're not going to be too harsh! Sampling itself is pretty intuitive and the resulting sound quality is good, albeit with some colouration. It's also very easy to get samples onto the card from your DAW. Connect the MPX16 to your computer via USB and it becomes a USB SD card reader - you can then drag and drop samples onto the card (16-bit mono or stereo WAVs only), much as you would with, say, an MPC1000. There's also a free utility to convert other format samples to 16-bit WAV format available on the Akai site. All things considered, the MPX16 is a significant upgrade from the MPX8. In particular, the addition of sampling/ improved sample editing is very welcome. The MPX16 is no doubt a very handy device not just for dropping samples live but also for capturing ideas on the fly, though it would be even better with a battery power option and some more effects (such as delay and chorus). However, if you want a solid basic sampler/MIDI pad controller that can be sequenced externally and that's not going to break the bank, the MPX16 is a solid option.